Over the past several years, the Japanese Canadian community has had to come to terms with the open acknowledgment of sexual abuse perpetrated by the late Goichi Gordon Nakayama, past minister of the Anglican Church, primarily against Japanese Canadian boys. 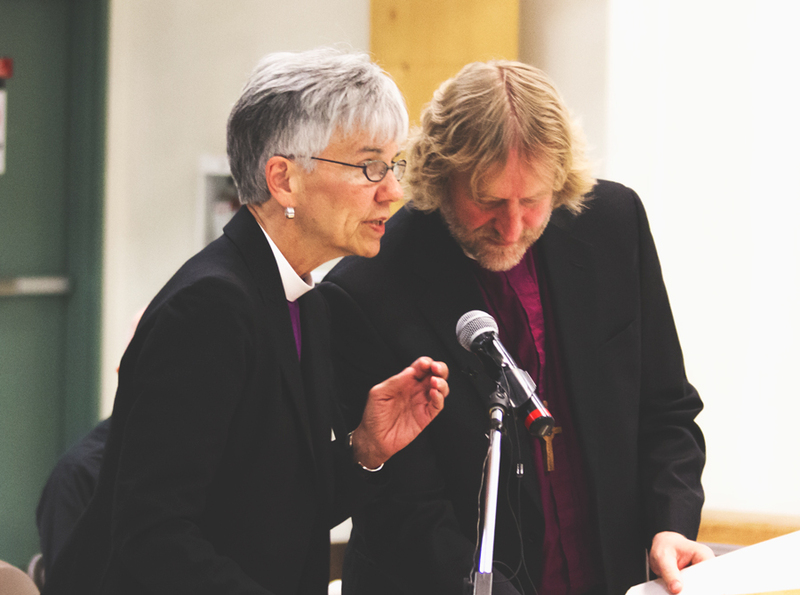 On June 15 of this year, the Right Reverend Melissa Skelton, Bishop of the Diocese of New Westminster and the Right Reverend Gregory Kerr-Wilson, Bishop of the Diocese of Calgary, presented a formal apology to members of the Japanese Canadian Community affected by the sexual abuse perpetrated by Mr. Nakayama over the course of 50 years, and withheld from the public for 20 more. The apology was instigated by members of a community working group that was formed with the aim of publicly revealing the truth, facilitating the apology, and offering support to survivors and their families. On November 22, Bishop Skelton, along with Dean Peter Elliott of Christ Church Cathedral and Father Daebin Im, Minister at Vancouver’s Holy Cross Church, met with community members at Tonari Gumi to follow up and to look at what meaningful action can be taken to facilitate healing. Bishop Skelton, before we talk about the apology and the follow up, I’d like to ask you a little about yourself and your experiences. You grew up in the Southern United States, the grandchild of sharecroppers, and your parents were sympathetic to the Civil Rights movement during a time of great racial strife. You yourself came to the Church relatively late in life, the single mother of a child with serious health issues. I’m curious how your experiences have shaped your perspective as Bishop of New Westminster. I believe my family’s humble background and my daughter’s illness and death have helped me empathize with those who don’t have much and with those who never had a chance. On a good day, this empathy actually lives within me and shapes my actions. On a bad day, I forget where I came from and who I am, and that is a bad forgetting, indeed! The more I’m in the role of Bishop, the more I believe that a sense of kinship with the downtrodden, the humble and the weak is essential to the role. Bishop Skelton, you and Bishop Kerr-Wilson read the apology on behalf of the the Church, but of course you have your own feelings toward both Mr. Nakayama’s crimes and the responsibilities of the church in dealing with them. Can you talk about what this process has meant for you, from a personal point of view? I deeply respect those who crafted the apology and the painstaking process that led to its public reading. At the same time, during the reading of the apology, I found myself wishing that I could have some time to express my own grief for what happened to the children and families damaged by Mr. Nakayama’s criminal actions. As a priest of the Church, I know something about how destructive sexual abuse can be to those who suffer it and to their families. I am outraged that this abuse of innocents happened, and I offer to continue walking the path of healing with any who have been directly or indirectly affected by Mr. Nakayama’s actions. The issue of sexual abuse, particularly when perpetrated against children, is by nature a difficult subject, but the time for keeping it in the shadows is past. The June apology has been put forth as the beginning of a healing process – do you see signs of that healing? Is it something that is even possible to see? I believe that we are still very much in a time of trying to recover the truth of what happened. We all need more time together and more opportunities to speak. I and others from the Church stand ready to hear any stories from survivors and their families or from others about the effect of the abuse on them and on their communities. In my recent experience with the work of the Truth and Reconciliation Commission, what I’ve learned is that the truth of a person’s experience must come before reconciliation or healing can occur. There is of course a lot of stigma and shame associated with being the victim of sexual abuse. Have any of Mr. Nakayama’s victims come forth, and if so, are step being taken to help them? I have been contacted by one person (not someone from the Japanese Canadian community) whom I invited to meet with me and share his story. While he was grateful that I acknowledged his communication, he did not want to meet. He did let me know that his healing had come through sharing his story with his wife of many years. I was very grateful that he had such a loving wife, someone who was able to hear about his traumatic experience and to comfort him. What did you take away from the November 22 meeting? I want to thank all those who have been involved in the apology and in all the efforts of truth-telling to date. I know that this has been very hard work for everyone involved, and I want to encourage us all, both in the Anglican Church and in the Japanese Canadian community, to continue to meet, to listen to each other, and to seek ways forward in the healing process. A community meeting took place on November 22, 2015 at Tonari Gumi with Bishop Skelton of the Diocese of New Westminster. Bishop Skelton, along with Archbishop Greg Kerr Wilson, signed the June 15, 2015 apology to Japanese Canadians for the abuse to young Japanese Canadian boys mostly, committed by past Anglican minister Gordon Goichi Nakayama. Other Anglican Church representatives at the meeting were Peter Elliott, Dean of Christ Church Cathedral and Father Daebin Im of Holy Cross Japanese Canadian Anglican Church. Bishop Skelton opened with her thoughts about the apology. Midway through saying it she felt it was missing a feeling of connection with the people. She understood that people who attended the event also felt the same. She was glad for this opportunity now to speak directly with community members. Bishop Skelton has zero tolerance regarding abuse. She and Peter Elliott acknowledged the attitude of the church in past times – keeping these matters under cover was not unusual. Authorities were not compelled to act first in support of victims. Examples are the residential school abuse, and other situations where abusing people in trusted roles were not brought to justice. Bishop Skelton talked about current ways the church ensured abuse by church clergy and other personnel is prevented – e.g., there are police checks on all, a mandatory sexual abuse course, protocols in place to immediately report and respond to a concern, additional training every five years. Peter Elliott referred to a past situation which indicated collusion between the church and heads of the JC congregation at Holy Cross. In 1979 a delegation went to the Bishop to ensure Mr. Nakayama was not allowed to have a formal role because of his abuse, but the delegation also sought the bishop’s secrecy about Mr. Nakayama’s abuse. The bishop complied. Participants asked aloud who was supporting the survivors? Did the bishop keep any record of the meeting with the HC delegation? A participant said her sister wrote to the head of the Anglican church in 1951 about her family’s knowledge of Mr. Nakayama’s sexual abuse of a young family friend. She wondered what happened as there was no response from the church. Bishop Skelton said this could be researched if she could know the name of the person who wrote the letter. Working group members said some first generation parents did not protect or support their survivor children. Language barriers between generations and Mr. Nakayama’s significant influence upon parents through language, culture, and his authority as a priest, all played a role in suppressing innocent children. Some children may have kept the abuse to themselves so they would not worry their parents. Other factors in maintaining secrecy were racism, the internment, and cultural attitudes about bringing shame upon families and community. But the first priority remains the survivors who should have been protected, acknowledged and supported. Participants asked what happens to the families of survivors? Is there an intergenerational effect? Bishop Skelton and participants expressed concern about the younger generations in survivor families. Working group members noted there is commitment between the group and church to offer support to survivor families. If the working group had not approached the church, would the church have initiated a process of reaching out to community and survivors? Calgary diocese files were sealed and there was no response to a community inquiry in 2006 about Mr. Nakayama’s abuse. Peter Elliott said the reason today’s working group and the church have been able to work together on opening up about the abuse, seeking apology and reaching out to survivors,families and community is because the Nakayama family made apology on their father’s behalf and supported this to go ahead. Toward the end of the meeting, plans were discussed to have a follow up community meeting. Bishop Skelton expressed that truth needed to be shared before reconciliation and she is willing to participate in follow up community meetings. • Uploading the filmed apology on internet as soon as possible so it can better reach the public. • Looking into rescinding tributes to Mr. Nakayama. For example, a cherry tree planted at St. Martin’s Church in North Vancouver remains an unacceptable symbol of tribute for one survivor family. The Diocese will be following up about the tree and looking into removing any plaques, and other commemorations to him. • Looking into making Mr. Nakayama’s letter of apology public. When survivor families, friends, community are ready, other appropriate reconciliation actions can be considered and brought to the table. Because it is important to support community members to attend future meetings with Bishop Skelton, there needs to be ample notice in The Bulletin about the next meeting. The bishop agreed it should be called in late February to early March.